The hard work that the Jeppe rowing section is putting in is continuing to pay dividends, with various crews across the age groups getting into the medals at the regattas held so far. Last weekend’s print regatta at Germiston Lake was, tragically, cut short because of a lightning strike, so many of the finals were not held. 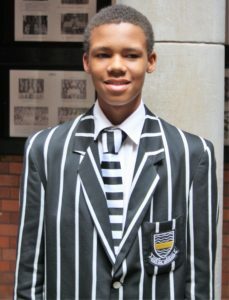 One that did take place on the Saturday was the under-14A single sculls and it was won by Mandla Green. Mandla is in grade 9, but he is a year younger that the other boys in his grade. He rows in the single scull in the under-14 age group, but in the bigger boats he is with the under-15s. “In the quad, my other boat, team work is the important thing and we have been together from the beginning of last year, so I still row with them,” he explained. It’s that team work that makes rowing such a great sport, he said. “We train and race together so much that we have become good friends,” he said. Jeppe is getting a reputation for producing good single scullers. Mandla Green is next in the line of those.